Washington (CNN) - Nine female Senate Democrats stood grimly together Friday afternoon in a move to ramp up pressure on House Republicans and force a compromise on the budget. "We are heading to a shutdown not because of a debate over money, not because of a debate over cuts but because Republicans continue to push a radical agenda against women," said Sen. Barbara Mikulski, D-Maryland. The nine women spoke one by one to decry what they called the chief sticking point in the budget negotiations: federal money for Title X, which funds family planning and health clinics. 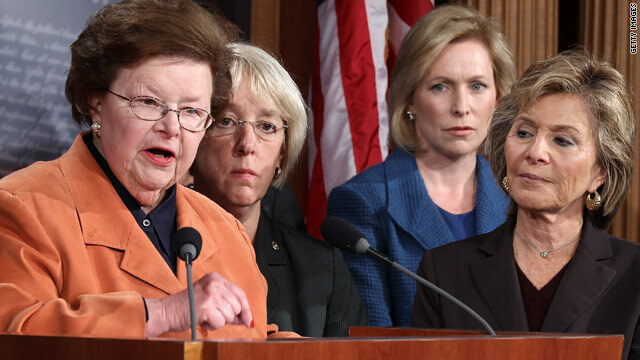 "Where we will not go is eliminating the healthcare for women," Mikulski said. "Make no mistake that this entire debate has included throwing women and children under the bus." House Republicans object that some of those funds go to Planned Parenthood, which performs abortions. While Planned Parenthood says it never uses federal dollars for abortion services because that is already illegal, Republicans don't buy it, arguing federal money essentially subsidizes Planned Parenthood which helps it provide abortions. One GOP proposal would send the Title X money to the states and let the governors decide how to spend it. The Democratic senators did not respond to a shouted question on that idea. Instead, the women argued policy measures like Title X cuts should not be attached to the government spending bill. "Women's health care shouldn't be a pawn in this debate," said Sen. Patty Murray D-Washington. Republicans, however, continue to insist negotiations are held up on disagreements over spending. And Democrats continued to insist that wasn't so. "We have a deal on the numbers," said Sen. Barbara Boxer, D-California. "And guess what this was about? Numbers." @fayse– Every time I hear this separations of church and state, I think the only way to do that is make one of them robots. Church and religion was never intended to run state and state was never design to run church–they both are ran by people who exercise judgment base on some principles. As long as you have people, you will have examples of greed and selfishness that cause the suffering of others. Let's not make this issue about the unborn anything other than someone make a choice, a very hard choice. Less government unless you're poor or woman. May God help the person who is both. It seems to me the last thing the Republicans care for is the Republic. @terry,va-How about we outlaw viagra. Problem solved. Once again this is a case of the GOP not acknowledging the facts. Somebody tell this gaggle of old hens to pipe down. Here's a message for you sorry, ugly, liberal hags. Why should my taxes pay for any kind of elective surgery let alone murder? My only wish is your mothers had had an abortion before they had you. Let me buy you all a round of drinks. "Bartender, vinegar and water for the ladies." These fanatical neo-cons are laying down a smoke screen and don't have any intention of avoiding a shutdown. They see it as a way to survive the tea party jihadists and further their support from fox nuts like O'Rielly, Hannity, Palin, etc. What is realy going on here? Does anyone realy believe a debate over 317 million dollars is going to shutdown the United States of America's government?!!! Look up the cost of the Iraq and Aghganistan war PER DAY!!! There is more than $150 million of nation debt currently being accumulated every hour ... WTF. @ Lynne...glad you got treatment for anything other than an abortion. Obummie has lied about abortion funding in the Obummie care bill and there should be language in the Planned Parenthood funding that prohibits abortion funding. We all know they do abortions and you can't tell me they don't use my taxpayer money to kill babies. .This is what happens when you skew the Hyde amendment for decades. Abortions aren't the issue. The government paying for elective abortion is. demcorats really and seriously need to pull their heads out. The Taliban hates women! They want you all to wear berkas! Planned parenthood doesn't use government money for abortions, it uses governement money for birth control. This is about depriving women of birth control to provide republican men with more desperate, poor women to keep for their entertainment, and larger families of undereducated, low information voters. This is sick . Democrats put a higher price on killing baby's than they do paying our troops this is why we have the problems we do in this country poor judgment and lies make for a screwed up country . But when we look at idiots like boxer [ i worked hard to be called a idiot ] we should have to understand that all she does is never in the favor of truth or the right thing.Come on America dump these fools in 2012 .
wow, every woman in America visits Planned Parenthood for their care!! and no other facility can do what they do? amazing! so no federal funds are used for the infrastructure of PP? if federal funds are subsidizing anything, like the surgical equipment used for abortions then federal money is being used for abortions. How in the world did this turn into an abortion fight? "While Planned Parenthood says it never uses federal dollars for abortion services because that is already illegal, Republicans don't buy it, arguing federal money essentially subsidizes Planned Parenthood which helps it provide abortions." - Republicans are making the "money is fungible" argument. I'll support their argument if they throw Rove in jail for using foreign money in US politics as part of his Crossroads PAC. Rove claimed his foreign contributions were kept completely separate. If we are to believe Rove, then we must also believe Planned Parenthood. It's hypocritical quibbling to say federal funds are not used for abortions in Planned Parenthood clinics. Some Planned Parenthood clinics perform abortions. This is not in doubt. All Planned Parenthood clinics receive a certain portion of their funding from the government. This is not in doubt. Now, the clinic may separate the government dollars from other funding dollars, and only use the government dollars on things other than abortion...but by doing so, they free up other dollars to use on abortions. Obviously, given the outrage, federal funding must be a fairly large source of income for many Planned Parenthood clinics. It's very easy to see that, without the federal funds, they would have to limit their services by a certain portion and (from the general outrage) stop offering abortions. So, while the actual federal dollars may not go to directly funding abortions, they are most certainly indirectly funding abortions.